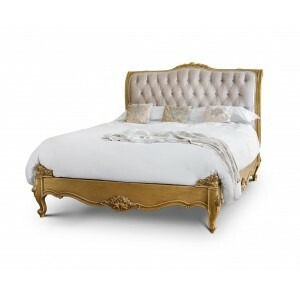 Our Versailles bed is an extravagant and opulent showcase of sophistication and luxury. It boasts both a beautiful antique gold leaf as well as button upholstery which adds depth to this piece. The French influence is abundant in this piece as it is inspired by the palace of Verailles’ exquisite style and aesthetic. This can be seen in the traditional cabriole legs and superb hand carved details. This truly adds class to any bedroom and meshes splendidly with other French style furnishings. Note: This item may require assembly upon delivery at an additional charge, please enquire with our sales team.